The Star is the go-to destination this Autumn, as a sponsor of the Autumn Carnival they are celebrating all things races, as well as live performances at many of their venues. 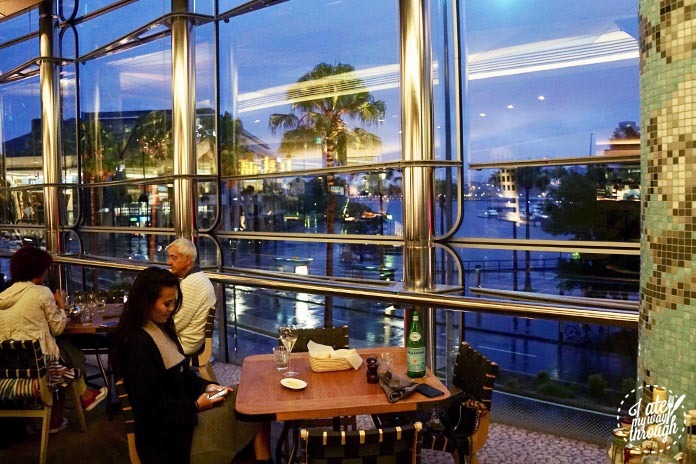 In addition there is a series of delicious dining specials such as the Champagne & Caviar menus at each of their restaurants, Harvest Buffet’s Chocolate spectacular and much more. 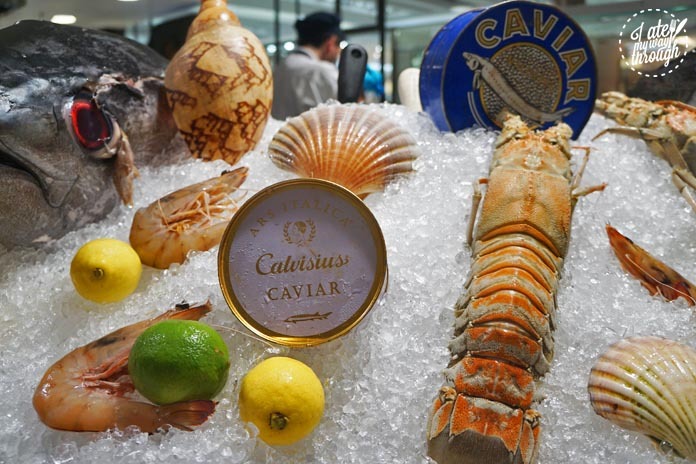 Life doesn’t get more indulgent than champagne and caviar, and luckily The Star has noted this with a new range of pairings at their three signature restaurants Balla, Sokyo and Black Bar & Grill. 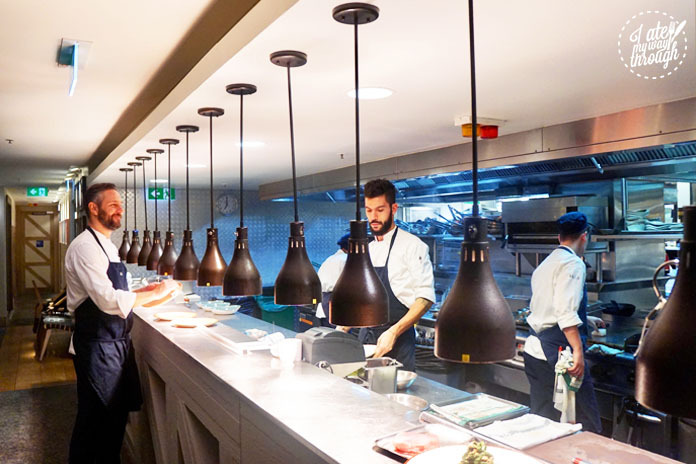 Balla is the Italian restaurant at The Star headed up by chef Gabriele Taddeucci, but I prefer his Instagram name ‘The Tuscan Boy’. He has created an authentic menu of Italian food featuring homemade pastas and delectable dishes showcasing the very best of Tuscan cuisine. As part of the Champagne & Caviar celebration, one can enjoy a set menu of caviar delights with three courses for $120pp plus the glorious pairing of some Moët & Chandon ($26) or Dom Perignon ($45). 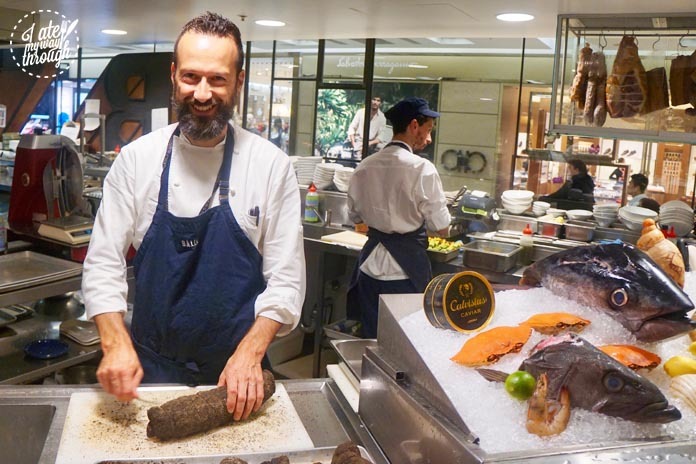 Walking into Balla, we were greeted by an impressive seafood display with fresh fish, an impressive caviar assortment and crustaceans all planted on a bed of ice. 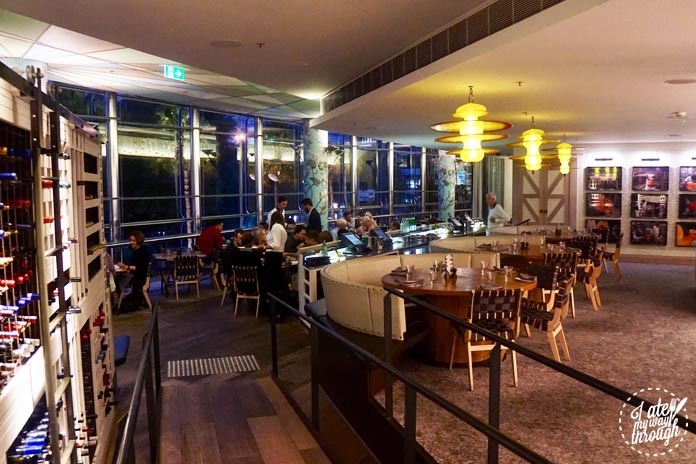 The open plan kitchen allows diners to see the chefs at work, whilst enjoying the view of the city skyline from the dazzling floor to ceiling windows looking over Pyrmont. 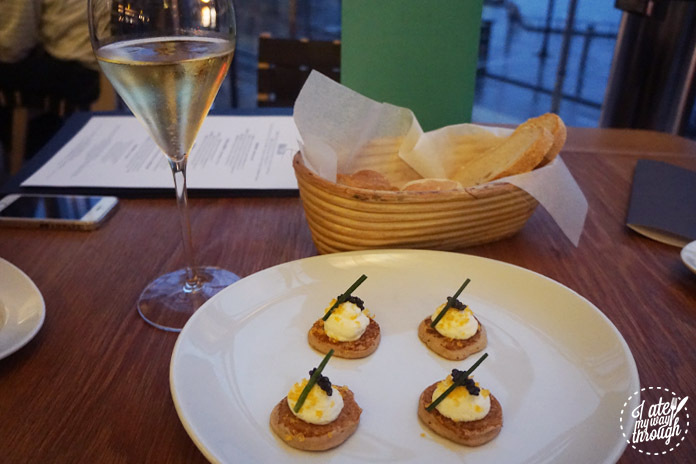 To begin, we started with an obligatory glass of Moët & Chandon 2008 Grand Vintage champagne ($26), and some buckwheat blinis with lemon ricotta and traditional Italian Oscietra caviar ($24). 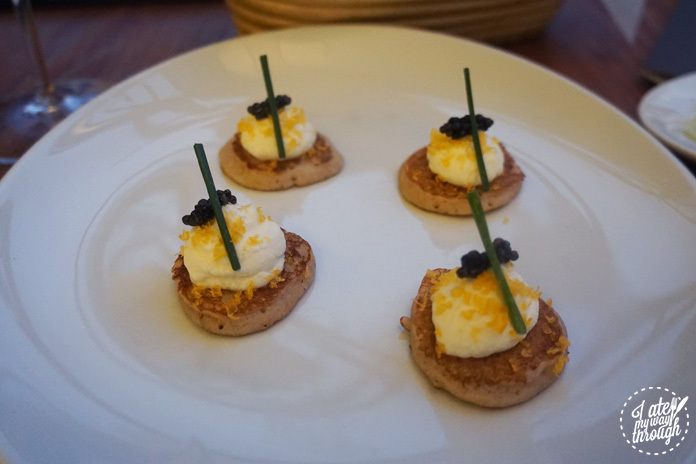 Four petite piklets were piped with a generous dollop of ricotta and topped with a sprinkling of tiny black caviar beads. It was a classic presentation of caviar in one of its purest forms, allowing you to appreciate it for what it is, however I would’ve liked just a slight more caviar to my piklet as the doughy consistency drowned out the magnificent little beads. 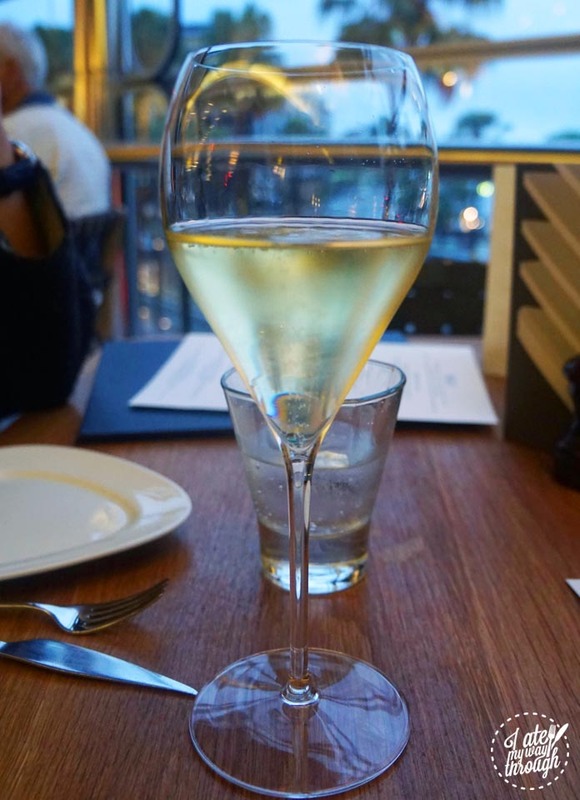 The plate was perfectly complemented by the refreshing bubbles of the Moët & Chandon ($26) which sat on the tongue creating a union of sweet and salty notes. 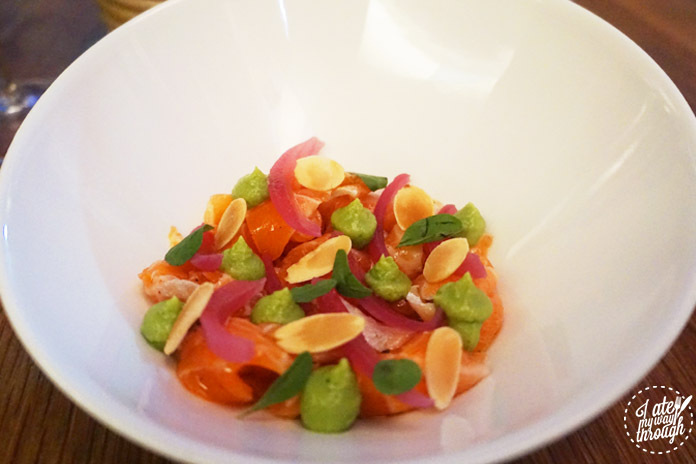 Next was the crudo of raw ocean trout, avocado, pickled onion and toasted almond ($20). This light dish was the perfect prelude to our other entrée of pasta. Consisting of freshly sliced ocean trout, you could almost taste the ocean on your tongue. This ridiculously picturesque dish was decorated with gorgeous green piped avocado, pink pickled onion, thin almond slivers and a few dashing’s of green leaves, it was almost too pretty to eat. The flavours were simple and clean, offering up an enjoyable way to start the meal. 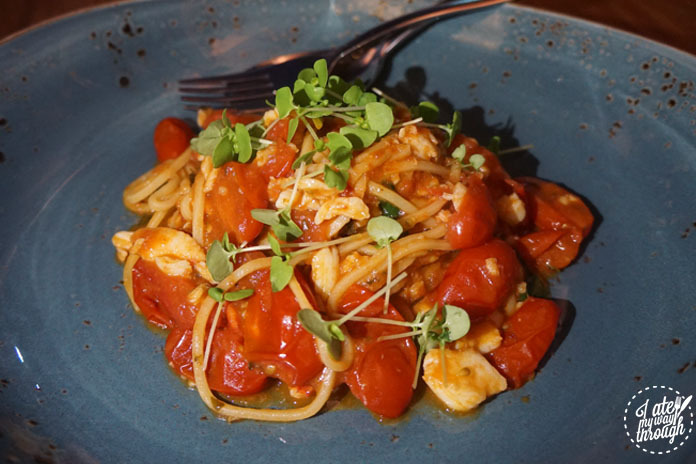 The spaghetti made of fresh pasta with spanner crab, cherry tomato and chilli ($27) sounded tantalizing and with the fresh seafood display we thought combining their two specialties of homemade pasta and fresh seafood would be unbeatable! We weren’t wrong, and thus were incredibly happy with our choice! The dish was amazing with pasta cooked perfectly al dente in a rich seafood bisque loaded with cherry tomatoes, and a generous serving of crab throughout. The tomato & seafood sauce was marvelous and we were fighting for the last bits from the plate! 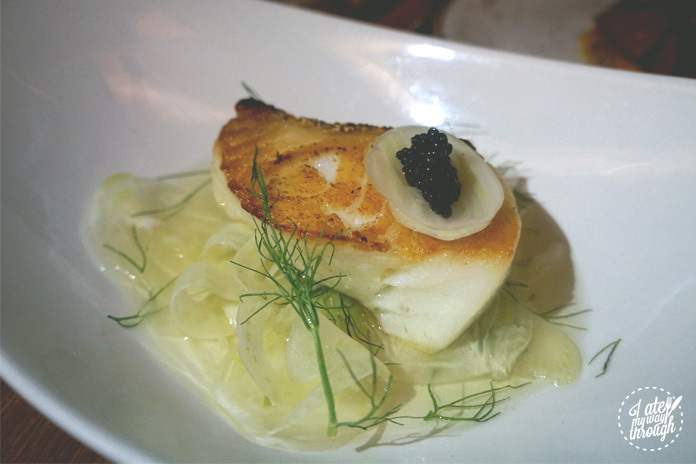 The main course from the Caviar special was toothfish with baby fennel, lemon consommé and original Italian Oscietra caviar ($59). The beautifully cooked piece of white fish, was meaty with a light golden outside. The fish was delicate and pleasing, with the salty accompaniment of caviar. It sat in a bed of lemon consommé and fennel, which sadly was lacking in flavour. Lucky the salty fish roe helped to spruce it up adding an extra burst of flavor. 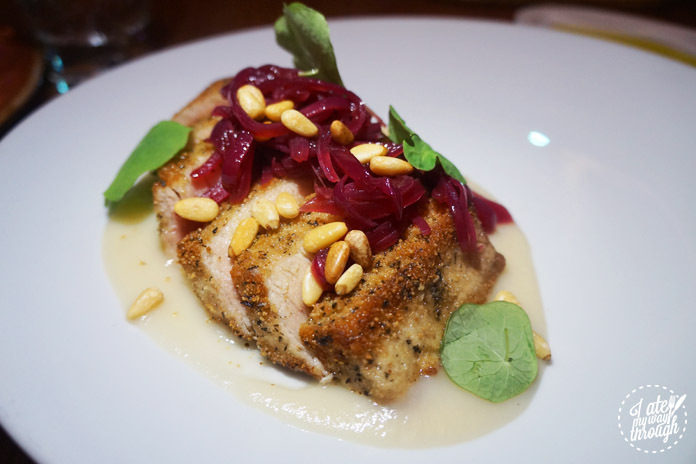 The yellowfin tuna seared, Sicilian sweet and sour onion, sultana and pine nuts ($42) was a standout dish from the evening, comprising of perfectly cooked tuna with a pink middle and outer crust of crumbs. Floating above puréed onion, which was lusciously velvet, it complemented the dish perfectly! Meanwhile the vivid pink sweet and sour onion crowning the top, accompanied the dish wonderfully to create a charming collection of flavours that fused together cohesively. 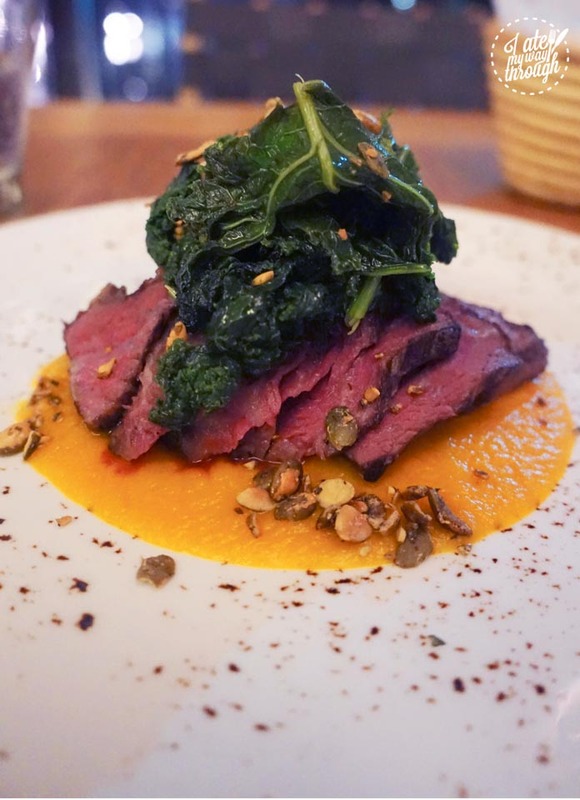 The other main was the Wagyu beef rump steak with pumpkin and toasted seeds, kale ($44). The marvellous piece of wagyu meat was cooked to delicious medium rare with its thin slicing exposing the bright pink insides with generous marbling and juicy flavour. The sweet pumpkin purée was addictively smooth and silky, whilst the sautéed kale was home to a delightful dressing that made eating our greens surprisingly worth it! 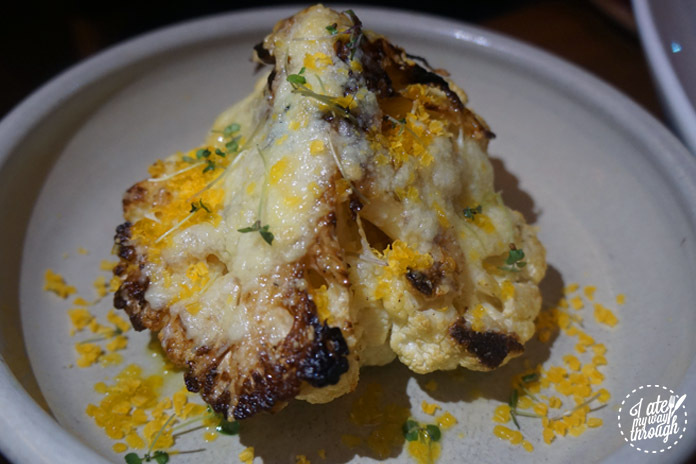 For a side, we settled on the baked cauliflower with pecorino and cured egg ($13). I absolutely adore cauliflower and love that it has become so popular on restaurant menus recently. This side dish encompassed the entire cauli head that had been roasted. It was topped with a pecorino parmesan, and little orange bits of cured egg that were almost powder like. It was a nice dish and I loved the cheese addition, however it could have been a little more cooked through and a little more cheese is always a good idea. Full to the brim, we skipped dessert and went for some coffee, which came served with two small coconut hazelnut macaroons, which were the perfect sweet ending to our meal. With a consistency similar to meringue these were crunchy petit fours were filled with caramelised hazelnuts. We loved them! For some comfort as the weather gets chilly, what better what than with some of the warming dishes by The Tuscan Boy with homemade pastas, amazing seafood and the indulgent caviar & champagne pairings. I don’t think you could go wrong!